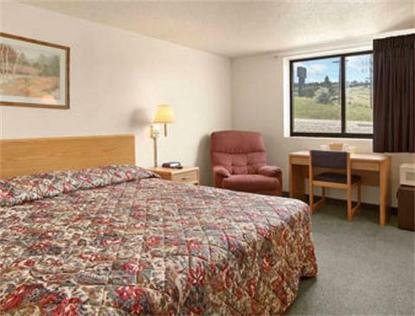 Super 8 Motel Rapid City/Rushmore Rd., Rapid City Deals - See Hotel Photos - Attractions Near Super 8 Motel Rapid City/Rushmore Rd. North America • United States • South Dakota • Super 8 Motel Rapid City/Rushmore Rd. The Super 8 Motel of Rapid City welcomes you to the scenic rolling Black Hills of South Dakota. We are conveniently located on Mt. Rushmore Road just 23 miles from Mount Rushmore Monument. Discover statewide history, Bear Butte State Park, Historic Deadwood, Spearfish Canyon, and world-class fishing in South Dakota. We are minuets away from Deadwoods Casino Gambling and Skiing. After you have spent your day traveling and exploring our beautiful state, park your car, truck, or RV in our large secure parking lot, then let our professional and friendly staff assist you in finding the clean and comfortable room that will fit you and/or your familys needs. Enjoy high speed wireless internet access in all rooms, expanded cable TV w/remote control featuring HBO, ESPN, Fox News and Disney. Join us in the morning for our complimentary SuperStart Plus continental breakfast. See you along the way.